Print is alive and thriving at the Seattle Times. 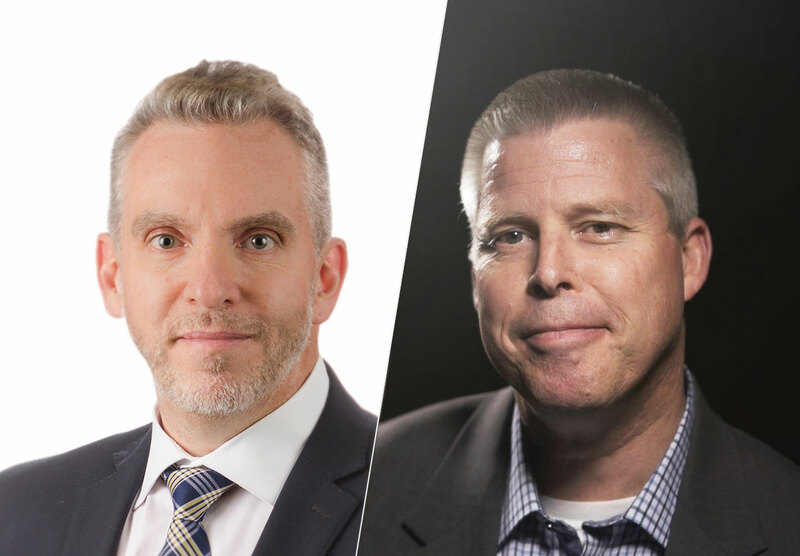 In this episode, George talks with Gary Smith, VP of Advertising at the historic newspaper, about how they are evolving to serve businesses in their market by adopting the mentality of a 121-year-old startup. Listen now! Attend VendastaCon April 3-5, 2018 in Banff Canada to turn your company into a ‘recurring revenue machine’. More info at vendastacon.com. 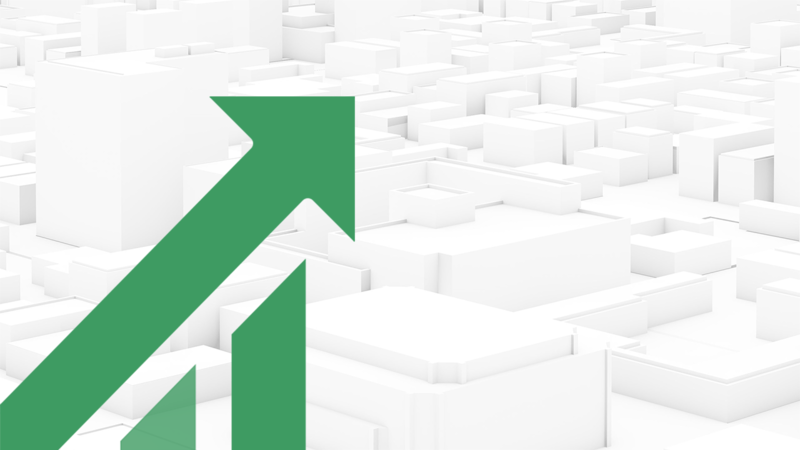 What are you gonna do to hit your agency’s revenue goals this year? Are we just going to go in and do transactional sales or is there a real plan to turn your agency into a monthly recurring revenue machine? I bet you that sounds pretty interesting if you’re in the agency business. And that’s what VendastaCon 2018 is all about. It’s the must-attend digital marketing convention, happening April 3rd to 5th in Banff, Alberta, Canada. Our mission from that event is to turn your organization into a monthly recurring revenue machine. Sales leaders, strategists from agencies, newspaper, television, radio, web, and brand, SEO, and even online advertising companies will be in attendance. And it’s all happening on one of the most beautiful places in the world—the Canadian Rockies in springtime and at the Banff Springs Fairmont Hotel. It’s absolutely amazing, and I’m looking forward to seeing you there. You know, outside of the sessions that we’re going to host, some of the mixers where we get to go one-on-one and discuss things, and beat up ideas, and speak to people that are doing it on a daily basis and find out what they’re learning, those are some of the most powerful moments at any convention, and we’ve got a whole bunch of them lined up at Vendasta. We’re going to be doing one evening in a gondola ride to the top of Sulphur Mountain. It’s all happening as part of VendastaCon 2018. This is it! The must-attend digital marketing conference, April 3rd to 5th, in Banff, Alberta, Canada. Here’s what you can do to get your tickets. Go online right now, www.vendastacon.com, and buy today. George: For the past six years, I’ve been traveling all over the world helping traditional media reps transition to selling digital marketing solutions to their customers. And I’ve had the privilege of working with sales managers, vice-presidents of advertising, chief revenue officers, and I get a shot this week in the Conquer Local podcast to go back to somebody that I’ve been working with for almost all of those six years. I met Gary Smith when he was the VP of Advertising at The News & Observer in Raleigh, North Carolina. Gary has now moved on to be the Vice-President of Advertising at The Seattle Times. And it’s interesting to see how Gary’s approach to selling digital has changed over those years. He’ll talk about why he invented the position “field sales coach.” He’ll also tell us about how they’re positioning The Seattle Times as a 121-year-old startup company and why that’s important. And he’s building on the brand “Seattle Times” rather than killing it, and there are other organizations that have decided to get rid of the legacy brand and just move in a new direction. George: Well, it’s a beautiful day. We are on location today here at the Seattle Metropolitan Chamber of Commerce offices. We happen to be in the Microsoft lounge. Gary Smith is the Vice-President of Advertising at The Seattle Times, and I really appreciate the invite. I’m up here doing a seminar, a sold-out seminar, I might add, with your clients and your sales team helping them conquer local. 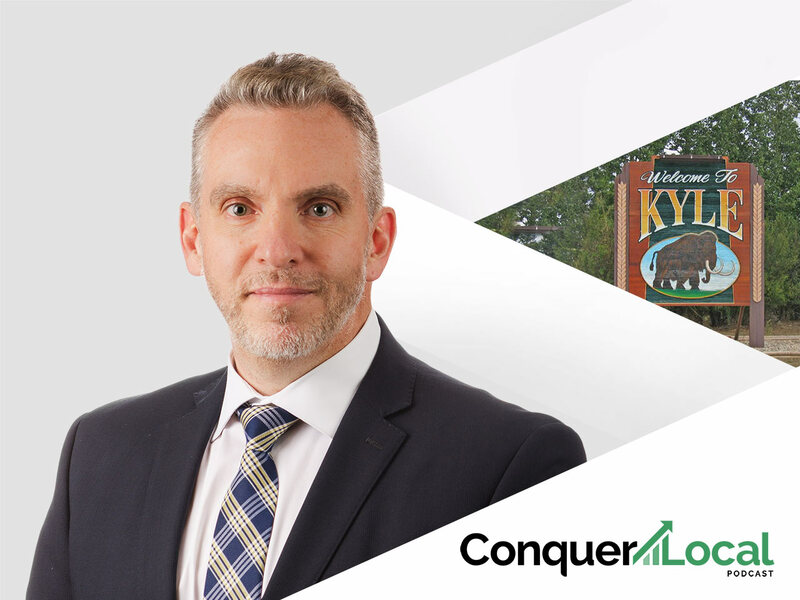 So, I thought it was a great idea to get you on microphone and on video here with us on the Conquer Local podcast. And you and I met, I believe, it was about three and a half or four years ago in Raleigh, at your former position. And then, you moved up here to Seattle and you’ve had an interesting run. Let’s talk a little bit about The Seattle Times company, first, just to give everybody a little bit of background. Or maybe even before we do that, let’s get a little bit of background on you and how long you’ve been at this as vice-president of advertising, and your career in helping local businesses. Gary: So, I’m in my 20…working on my 29th year in the industry. I spent 27 years in two markets with McClatchy. From the northwest originally, spent 14 years in Tacoma, and in 2003, moved to Raleigh, and had been on the internet sites since the beginning in Tacoma and all through my career in Raleigh. Went to Raleigh to run the internet division. Internet became internet and classifieds, and internet and classifieds became all of advertising. And The Seattle Times came knocking on my door at the end of 2016 and said, “We’ve got a great opportunity for you.” And the northwest is my home, and so decided to make the career move and come to the northwest. And so, just on one year anniversary here with The Seattle Times. But I love to be back in the northwest and love to be at the, you know, the northwest premier media company and really take what I’d learned in those first 27 years and apply it here to The Seattle Times. George: So, how many people in your department? you know, the “Conquer Local” podcast is all about helping salespeople become sales professionals. How many people in your sales division? Gary: So, there’s about 75 total in the sales division and roughly half of those are front line salespeople. And then, it’s sales leadership, but also a significant investment on the execution on the ops side, especially when you look at digital. And, you know, we’ve got a significant investment in, you know, personnel talent to be able to execute on these complex digital buys for our customers, and then to be able to help our sales staff report and make adjustments to those buys because digital media is not a “set it and forget it” media. George: That’s absolutely right. So, there’s been…when I was here, I think it was six or eight months ago when you first had taken over and you recognized that you needed to add some solutions to your stack and get some training in place. There’s been quite a few changes in the organization, I understand. Tell me a little bit about that, the reps that when you walked into the building, there’s been a change in that org. Gary: Yeah. So, there’s probably been, you know, since when I got here a year ago till now, roughly 50% turnover. And we knew that coming in, and I was very clear with the executives that that was probably gonna be the case, that we really need to transition from being a newspaper company to a media company that is really product-agnostic, and that we’d be adding a lot of digital components to our stack, to our solution for advertisers, and that not all the reps are gonna be able to make that transition. I’m very happy to report that none of that transition… you know, during that whole time period, we didn’t terminate anybody. But we changed the expectations, changed the commission plan. And so, we’re gonna put lots of training around it. But you have to sell these products. You have to learn these products. And we have a lot of people self-select and say, “You know, this isn’t for me. I don’t like the vision where we’re going or I don’t feel like I can make that transition from selling legacy products into selling both legacy and digital.” And so, a lot of folks made that transition. And I’m really happy to report that, you know, as folks decided to make that move and as we backfilled their position with new folks, that I am extremely bullish on our future with the talent we’ve hired, and the energy that we’re putting into growing that team, educating that team, and making sure that they understand the values of The Seattle Times company and what it means to be a part of our new brand in the marketplace, Seattle Times Media Solutions, which is really what we’re all about, is providing solutions four our advertisers. Gary: Yeah. So, when I got here, there are several things we did. You know, certainly, bringing everybody’s knowledge level up to where they feel confident that they can talk about these different solutions that are brand new to them. We knew we had to put a lot of energy into education. Gary: So, first off, we created a brand new position called the ‘field sales coach’, and their job was to coach on sales process, some product training, sure, but coach on process. Coupled with that, we instituted every Friday, from 9:00 to 11:00, a digital training seminar with various topics. Fifty-two weeks out of the year, we’re committed to it. We have a schedule that goes out six to eight weeks in advance of what are the topics coming up that we need to talk about. And it’s a way where we know, once a week, for sure, we’ve got dedicated time with our staff to go over products. Sometimes, you know, we have tiered sessions. Role-playing is certainly big in that. You know, we’ll roll out a product. We’ll do follow-up a couple of weeks later. We’ll ask them to come back and share, you know, successes or struggles. And then we’ll do role plays and making sure that they get it. And this constant learning and dedication to the success of the salespeople has really changed the culture as well. They’re excited about these new products. They’re excited to take these products to market. And they’re excited to be a part of our company. And I think the commitment with the field coach position and these trainings have really added to that kinda culture change from the sales side. George: Well, it’s interesting to me. You know, I’ve known a couple of your senior people in other roles that you have in the company. And I met some of the reps when I was here six, eight months ago. It’s interesting to me that, you know, they’re not just happy to be doing what they’re doing. They’re not motivated because you’re pushing them. They’re motivated because they love what they’re doing. Gary: So, it’s beyond just the training sessions. The training sessions allow my leadership team to then set tangible KPIs for the reps of actions that they need to do. And so, it really wasn’t the training sessions that got them, but it’s “Okay. Now, I’ve gotta go put this into action. I’ve gotta do it and I don’t wanna do it,” you know, or it’s not…you know, “I’m not behind this.” And so, if you’re not committed to it and you don’t wanna be here, I was very blunt that you’ve gotta learn to sell digital. We used to have four-legged sales calls when I got here, digital specialist, and I stood up in front of everybody at my first meeting and said, “They’re are crutch and they’re gonna go away.” I’d had a plan on taking all of 2017 to get to the point before we would redeploy those people into other positions. And our leadership team came to me midyear and said, “We’re ready to do it now.” And so, we fast-tracked that and did that at the beginning of July last year. And so, all these trainings and everything is about, “This is the direction we’re going,” and it’s allowed the folks that are left to have the confidence. The ones that aren’t, it made it easy for them. But it was really the KPIs around the follow-up that was probably the bigger driver, not so much, you know, participating in the training. George: So, a couple of things about the Seattle market number one, and I have a prop here. So, those of you on the podcast that are listening are not able to see it, but I am holding The Seattle Times newspaper. Those of you watching the video could see it. And not like other newspapers on a Thursday that I’ve seen, it’s still a robust print product. Also, you may be able to hear in the background, there’s probably five or six cranes operating within a block of us. This is the fastest growing market in North America. And so, you’ve got a tiger by the tail when it comes to an economy that’s very strong. Could that be part of the reason why the reps are motivated as well? Gary: I would certainly hope so. You know, there are reps that are here that are doing really well. They’re paid well. They do well commission-wise, so that helps. But the family commitment, the Blethen Family that’s owned the paper for 121 years is steadfastly committed to this community. This metro paper has stronger editorial page count, seven days a week, than any metro I’ve seen in the country. And it gives us a very robust product to sell advertising in. And print advertising is not dead. It’s evolving. It’s changing. But there’s still a marketplace there for us, and it opens the door and provides huge credibility for the sales staff. When we were evaluating earlier in 2017, how do we wanna go to market from a digital perspective? And some companies have dropped their legacy brand. As I look at this market, talked to advertisers, talked to the community about The Seattle Times and the perception in the marketplace, I very quickly came to a realization, we gotta build on this brand, not throw away everything that’s been done over the previous 121 years. So, we now go to market as Seattle Times Media Solutions. And that we’re not just about a seven-day-a-week print product. It’s still very strong and it opens a door for us and has huge credibility in the marketplace. And so, that’s a confidence that I am very vocal with my sales staff, is you got something here that doesn’t happen across the country. Other newspaper and media companies, sales reps don’t have the luxury that you have to have as robust a product behind them as we have here in this marketplace. You then add there’s, I think, 65 cranes in Seattle right now, not just five or six, around here. There’s one directly across the street. With what used to be our parking lot, there’s about 100-foot hole right now, and there’ll be in a 42-story high-rise in a year and a half there. That growth gives us huge opportunity and our staff sees that. They see that there’s huge opportunity there. And so, we’ve got to equip them to be successful. Give them the tools. Give them the training. Give them great products like the products your team, you know, helps us with so that we can go to market and be successful. And at the end of the day, part of the reason our staff structure is the way it is, is we didn’t have to be able to report on that and be able to communicate back to the advertiser what’s working, what’s not working, how do we adjust your budget so that we can give you the best return on your investment. If the advertiser’s KPIs changed, then we have to then adjust their media plan. 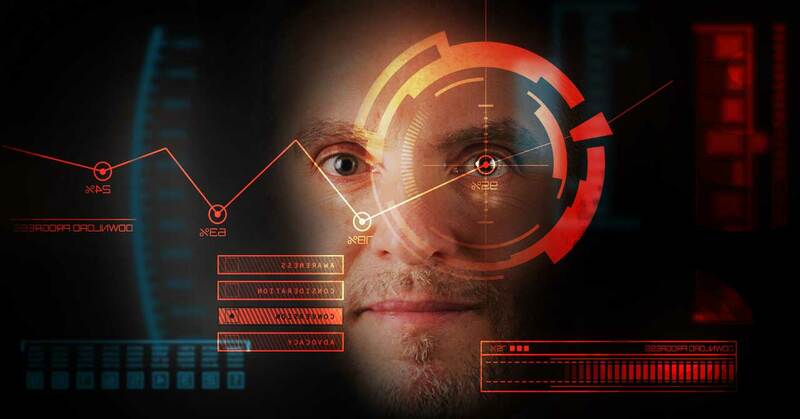 And so, it’s really about this 360-degree focus on getting them into the products, but then evaluating how it’s working, and adjusting so that our clients, ultimately, are successful. George: So, you were on a conference call when everything kicked off today and I got to spend some time with your reps, and it wasn’t one. I talked to about five of them and all of them talked about needs-based selling. So, you’ve done a good job of driving that into the organization. I wanna go back. You’ve been doing this 27 years. You’ve been a sales manager for a long time. You’ve been vice-president of advertising for a long time. When was the moment that you recognized that you weren’t in the print business, you were in the digital business? Did it happen? Did you decide? Or did it just occur? Gary: Well, personally, for me it happened years ago. I came up on the digital side. I’ve got a computer science degree from an education standpoint and ended up in the newspaper business, and so…but my first job out of college was sales. And so, when this weird thing called the internet came around, they’re like, “Oh, we need people that understand the technology but also understand the business side.” I happened to be in a unique position, so it’s allowed me to grow in my career and end up where I am. You know, 15 years ago, almost 17 years ago, in the early ’90s, when I first started dealing with building the first websites for newspapers, that’s when I realized, you know, for us, it’s about audience. It’s about having products. Whether it’s our own products or whether it’s other digital related products, whether it’s our own digital products or it’s third-party vendor solution products that we can bring to the marketplace, our customers are gonna be successful if we do what we’ve always done for 121 years, which is connect the consumer audience with our merchants. And for 110 years, that was primarily done with print ads in our newspaper. Now, it’s done with audio. It’s done with video ads. It’s done with email marketing. It’s done with native advertising. There’s lots of different ways we can connect our advertisers, helping them with their website and all the SEO solutions. But at the end of the day, our job is to help connect that consumer base with what they’re looking for which is, a lot of times, not only our content that we have, but also the advertising messages that our merchants have. George: So, you come up with the famous saying and it’s now been beat into the organization, I think you called it a slam line earlier or a slogan. Let’s hear what that slogan is for The Seattle Times. Gary: Well, so The Seattle Times is 121-year-old company, but we really have the mentality of a digital startup. 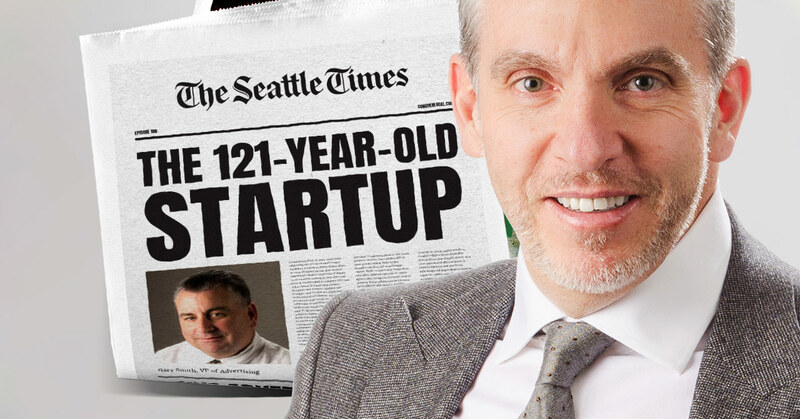 And so, we came up with the tagline “121-year-old startup company.” The Seattle Times is 121-year-old startup company. We have the legacy and rich history of being in the community and providing a great product and services for our advertisers for 121 years. But the digital landscape is changing so rapidly and so fast that we have the mentality of a startup company, that we’re building a whole new channel to support our advertisers with their solutions. And so, that became a tagline. Our publisher heard me mention it at one of our staff meetings and liked it so much that he had our marketing group build a whole campaign around it. And so, we have a lot of internal marketing go in the paper and on our website promoting that we are this new media solutions company and that we’re 121 years old but we’ve got the mentality of a startup. George: I noticed the news released here recently that you’ve joined a board. And you wanna talk about the LMC and your board position there and what that means, you know, on a day-to-day basis for you. You know, it’s quite a robust organization. It’s pretty much all of media in the United States. Gary: Yes. So, I’ve been a part of the LMC for a while in my days working at McClatchy when I was in Raleigh, but became even more apparent when you join a family-owned independent newspaper. How do you stay connected in the industry? How do you stay connected with what’s going on? What our peers are dealing with? And so being an active member of the LMC became very apparent. And so, when I came to The Seattle Times last year, I stepped up my activity with the organization. The end of the year, they had a roll call for folks that would wanna be on the board. And so, I threw my name in a hat. It’s a voted position, so the collective membership had to vote. And they voted me in, so I’m starting beginning of a two-year stint of being on the board. But for me, personally, being at a single into the family-owned operation, it was a key way to stay connected with my industry peers. A lot of which I’ve known over my previous, you know, 27 years at McClatchy, and now my, you know, year at The Seattle Times. So, it’s a way to stay connected. It is a commitment. You know, it’s an “active working board”, they like to call it. But the group is really meant to help further media, not just newspaper, but TV, radio, media. And collectively, we, as an organization, have the power to deal with the folks like Google and Facebook, and Apple at a group level as an organization better than The Seattle Times ever would as a standalone entity. So, for me, it was a way to stay connected in the industry, keep my professional knowledge of the industry and what’s going on, and the issues we’re running up against, continue my networking of folks to bounce ideas off of or “how are you dealing with this challenge or that challenge?” So, I’m happy to do it and it’s a great organization. George: So, you would say that that role then is a big part of your personal development outside of the LMC, which I know is major commitment. What other things does Gary Smith do on a daily basis to keep you connected and keep you on the cutting edge and make sure that you’re driving your career forward and, ultimately, that impacts the 75 people who work with you? Gary: Well, I would first say, personally, I’m not concerned about my career. I plan on spending the rest of my career at The Seattle Times and hanging it up in 10 or 15 years. So, from that perspective, I’m very content. But at the same time, you gotta stay connected. So, certainly, things like LinkedIn is a big one for me. I’ve got a pretty big network of professional folks and as they post things that keeps me updated. Reading the number or the trade digital pubs that are out there is another. And then, you know, going to conferences and interacting with, you know, the vendors that are there like yourself as well as my peers. Those are kind of the main areas that I try to do to stay connected. George: Say one of your young salespeople come into your office and they’re looking for advice, what some advice you would give somebody starting out today with, you know, everything that you saw, and especially, with your very unique start in the business and the fact that you’ve been on the digital side? Well, you know, you’ve been involved in everything. But what…you know, they walk in and they’re looking for advice. What would you give them for advice? Gary: Well, I think about…to me, it comes down to a couple of things, where are they in their career at that point and what can I do to help them over really the next, you know, 6 months to 12 months, but then also, you talk to them about how it can put them on a longer path. Depending on who the person is, if it’s a millennial, they typically have a shorter cycle that they’re concerned about. So, you may be talking about the next three months or six months what they can do to grow in the organization locally. If it’s a veteran, that’s a little older and been in the career longer, then it’s different conversations about do they have aspirations to go down the management track or not. And you don’t have to to be successful in this industry. So, I don’t think there’s a cookie cut answer to that. I think it depends who the rep is and where they are in their career. But you certainly need to be able to read your staff and know where they are, and certainly, age and professional level of where they are. Maybe they just need help on figuring out how to conquer hitting their numbers every month. Maybe there’s a different perspective there, different customer base to look at to try to go after. Maybe they’ve only been focused on two, or three, or four key industries, and maybe there’s a couple of other industries that we can help them with. So, I think it depends on who the rep is. George: Well, we really appreciate the time and having you join us here on the Conquer Local podcast. And wish you all the best as you continue with the 121-year-old startup that is The Seattle Times. Thanks, Gary, for coming on board. Gary: Thank you, George. And I really wanna thank you for taking time out of your week to come to the beautiful northwest and present to our customers because I know they gained a lot from it and I know our event wouldn’t have been as successful if you weren’t here. So, thank you for coming to Seattle. It’s interesting to see how Gary’s approach has changed over the years. He’s introduced this field sales coach, and that person is really starting to drive the digital conversation with his customers. And we’re gonna get back on the podcast here in a year or so, mark my words, with Gary Smith, and see how this whole 121-year-old startup thing is working for The Seattle Times. Now, the ownership group is behind it and the publisher is behind it, and it’ll be interesting to see if Gary is able to execute on his vision. We appreciate having them on this week’s edition. It’s the Conquer Local podcast. My name is George Leith. I’ll see you when I see you.